A problem in Ubiquitous Computing environments is the coordination of a multitude of different devices. 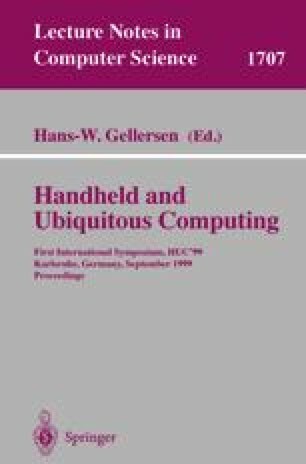 This paper presents the RAUM- system that provides the basis for communication between devices in a Ubiquitous Computing environment. Such communication considers the spatial order of objects in the environment similar to the way humans do. The RAUM- system uses this order to establish communication connections between objects in the environment and gives applications the possibility to react according to the spatial order. This paper proposes that in Ubicomp environments such spatial-dependent location-aware communication is superior to other communication strategies. Also three example set-ups are presented indicating that applications for Ubicomp environments benefit from the RAUM-system in various ways.